ONE-OFF MMS DECEMBER 2018 22 mmsonline.com dkorn@mmsonline.com Derek Korn EXECUTIVE EDITOR @mms_derek Set Up a Student-Run Shop Near You This replicable student-run business model offers promise not only in terms of workforce development, but also in potentially lowering U.S. manufacturing costs. 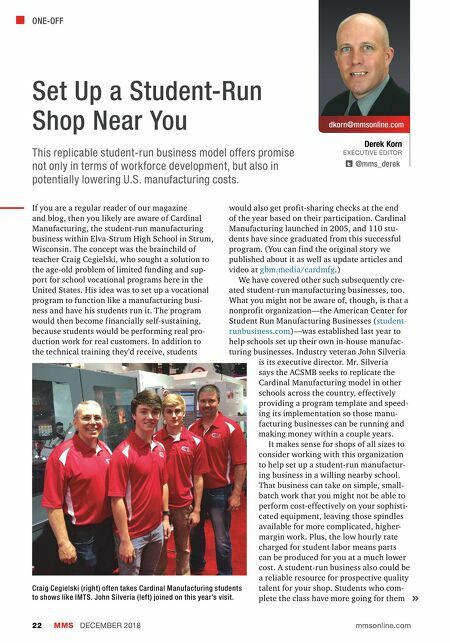 If you are a regular reader of our magazine and blog, then you likely are aware of Cardinal Manufacturing, the student-run manufacturing business within Elva-Strum High School in Strum, Wisconsin. The concept was the brainchild of teacher Craig Cegielski, who sought a solution to the age-old problem of limited funding and sup- port for school vocational programs here in the United States. His idea was to set up a vocational program to function like a manufacturing busi- ness and have his students run it. The program would then become financially self-sustaining, because students would be performing real pro- duction work for real customers. In addition to the technical training they'd receive, students would also get profit-sharing checks at the end of the year based on their participation. Cardinal Manufacturing launched in 2005, and 110 stu- dents have since graduated from this successful program. (You can find the original story we published about it as well as update articles and video at gbm.media/cardmfg .) We have covered other such subsequently cre- ated student-run manufacturing businesses, too. What you might not be aware of, though, is that a nonprofit organization—the American Center for Student Run Manufacturing Businesses ( student- runbusiness.com )—was established last year to help schools set up their own in-house manufac- turing businesses. Industry veteran John Silveria is its executive director. Mr. Silveria says the ACSMB seeks to replicate the Cardinal Manufacturing model in other schools across the country, effectively providing a program template and speed- ing its implementation so those manu- facturing businesses can be running and making money within a couple years. It makes sense for shops of all sizes to consider working with this organization to help set up a student-run manufactur- ing business in a willing nearby school. 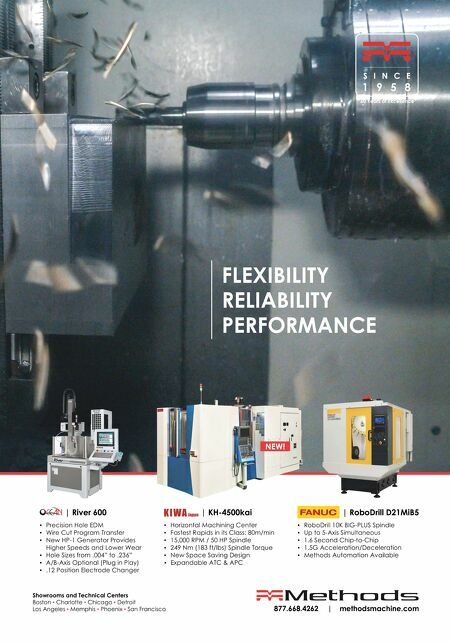 That business can take on simple, small- batch work that you might not be able to perform cost-effectively on your sophisti- cated equipment, leaving those spindles available for more complicated, higher- margin work. Plus, the low hourly rate charged for student labor means parts can be produced for you at a much lower cost. A student-run business also could be a reliable resource for prospective quality talent for your shop. Students who com- plete the class have more going for them Craig Cegielski (right) often takes Cardinal Manufacturing students to shows like IMTS. John Silveria (left) joined on this year's visit.